Saturday 24th April turned out to be a very good day for many reasons. 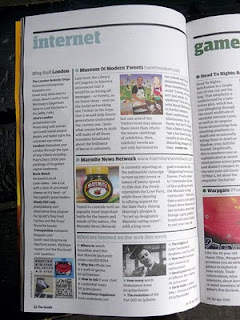 One being that I discovered that Jane's London is listed on the Internet page of the Guardian Guide in a column about London blogs. Wow! I had no fore-warning of this so did not manage to get a copy for myself. They even put some of pictures at the bottom as used in my 'Are you feeling frisky?' post, which I thought was rather amusing and a bit ironic seeing as they were so cheeky to use them without asking. Though they don't appear on the web version. 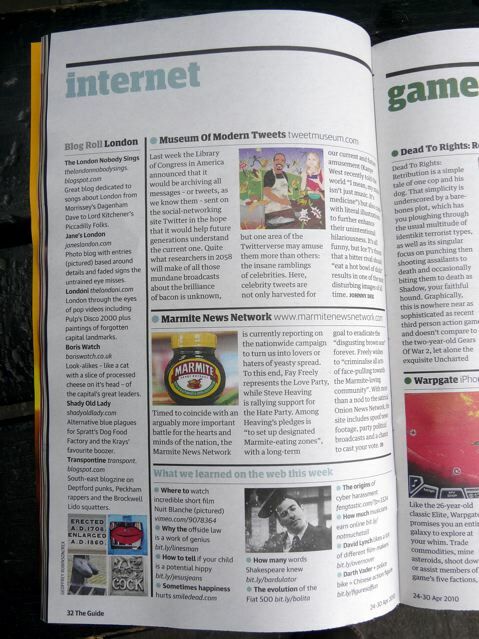 But hey, I hope this means I get some more traffic this way and people can see that there are some even more good London sites and blogs, as listed in the column to the right under 'Other relevant links'. Nice one, it's publicity ahoy from the Guardian at the moment. I'm visiting your site because of the piece in the Guardian! Great idea for a blog. Looking forward to spotting some of these around London. I'm totally here because I noticed your blog in the Guardian. Love the name Jane and I love London, so thought I should check it out. Quite surprised they didn't ask to use the pictures...that's illegal or something, isn't it? Anyway...lovely blog, just about to snoop about it a bit more. Well done you - and now I'm intrigued about the other things that made it a good day?? ?